2 meters of tulle, ( for a small child)/ 5 meters (for an adult). I recommend that before you purchase the material, decide what length your tutu skirt should have and discuss with shop assistant how much fabric you will need. Chloe-Sofia’s tulle is 35 centimeters long (mine 1 meter). A piece of a cardboard or a cooking pot. Start with rolling tulle into a cylinder and cut it into 10 cm wide sections. Measure your waist. 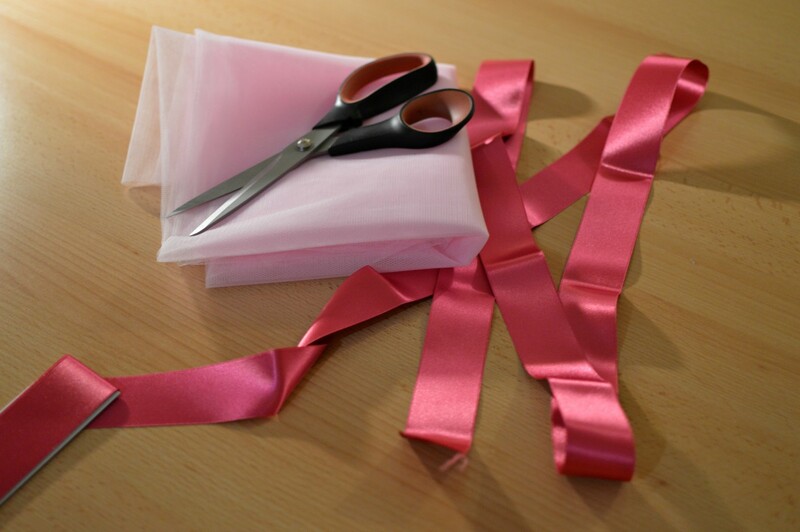 Cut the ribbon (add 10 centimeters on each side so that you can tie a nice bow at the end). 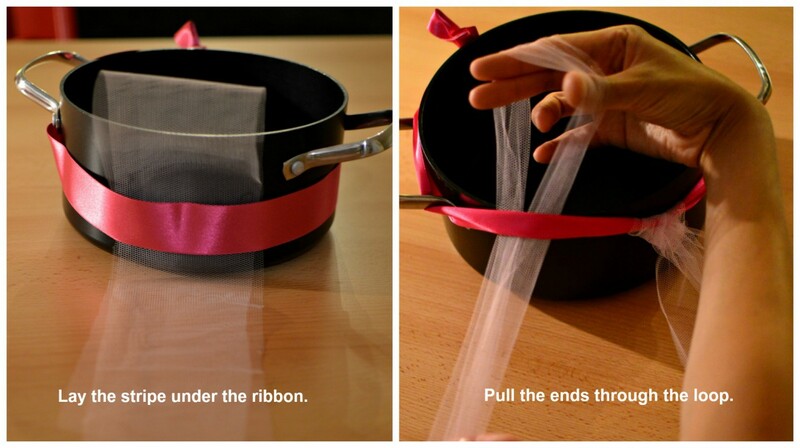 Tie the ribbon around the cardboard or the cooking pot. 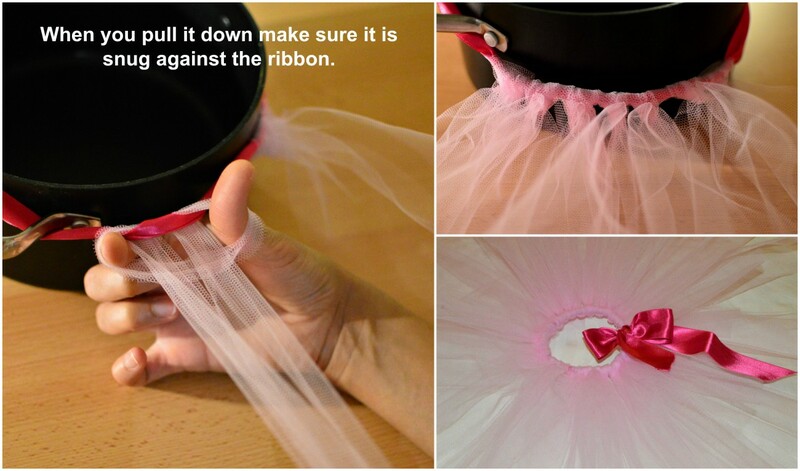 It will make it easier to tie the tulle strips on it. Fold a stripe of tulle in half and tie it to ribbon as shown below. Photos by Alex and I. 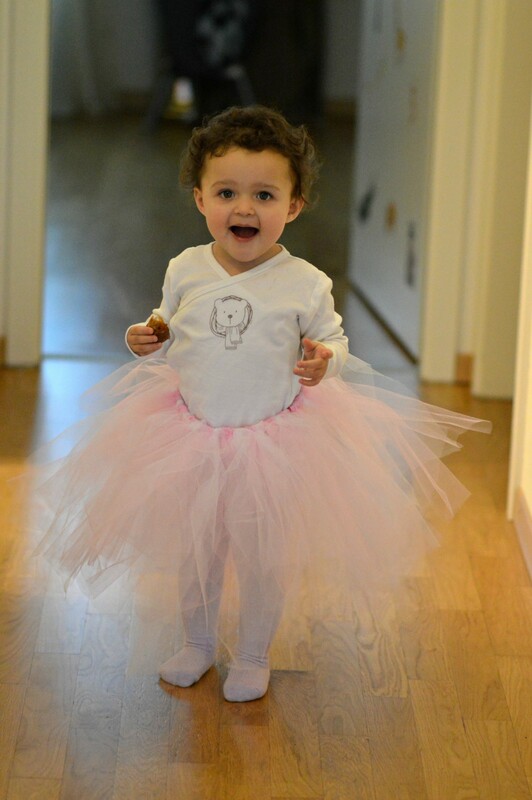 The tutu skirt is so adorable and so is your little one. She is so cute! So pretty…and easy to do! My daughter would love to make a tutu skirt! A great project for a rainy weekend. such a cute DIY! love tulle skirts! How cute is she?! The tutu skirt is so pretty on you and your daughter, that’s a great DIY! Thank you for sharing! I love this project! It’s super easy to do, and your daughter is so adorable. So adorable! I love that we never want to outgrow dressing like a ballerina! So adorable, your daughter looks so sweet in her tutu, you are so creative. love your skirt with the moto, fun! Chloe-Sofia is so cute! This idea is great and doesn’t look that hard at all! I’ve said it before, and I’ll say it again, Miri!! You are so creative and amazing!!! I absolutely adore this pic of your daughter! She is so sweet and love your matching skirts. Very cool DIY Miri! Miri, I love both of these skirts! Yours is so edgy and fun! I amy have to make one for myself because I am loving that rocker vibe you created with your!